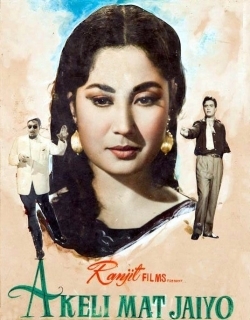 Akeli Mat Jaiyo is a 1963 Indian Bollywood social film released on 1963. The film is directed by Nandlal Jaswantal, produced by Chandulal J. Shah under banner named Ranjit Studios. Seema is staying in a working Girls Hostel-she is very conservatively brought up by her father, who manufactures dolls, which Seema sells in the market. She never goes out in the evening, either for dinner or dance like other girls because she has no boy friend. Girls make jokes about her and Seemas frend Shobha is very about the whole affair. . One day shobhapersuades Seema to inform other girls that she is going for dinner with ther fincee, at Astoria Hotel and she tells them that her fiancee is a Colonel in the army. Girls are surprised and shocked and they decide to go to Atsoria Hotel and see the Colonel. . Seema is forced to go to Astoria Hotel. She had no boy friend, no fiancee. However, she spots a young handsome military man. She appro- aches him, tells her story and requests him, tells her story and requests him act as her fiancee for the time being. . This starts a romance between the two, though seema wanted to end it there and then. The Colonel, whose name is Rajinder, says "I am here for three days only and please continue to see and dine with me and that will also convince your girl friends." . They fall in love with each other. One night, a photographer takes their picuture together and next morning it is published in papers with a caption "Prince and his Bride-to-be". Girl show the picure to Seema. She quarrels with the Prince and bangs the phone. Same picure is seen by the king and queen, father and mother of the Prince who is gone for shikar, in the camp. Princes A.D.C. shows the photo picure to the real prince. He is surprised. He sees the similarity of faces and rushes to Delhi to find out who is the man - rather the IMPOSTER. . Girls show the picture to Seemas father, who has come to visit her. Seema is forced to admit that she is engaged to Prince, who intends to marry her. . Meanwhile, the two crooks, who had installed Rajinder as the Prince, come to the hotel and threaten him to cooperate in getting delivery of the necklace from the Jeweller, otherwise his mother, who was kidnapped by them, will be killed. 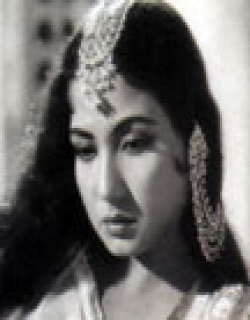 Seema (Meena Kumari), a working girl, staying in a Womens Hostel, pretends to be on a date, and when about to be found out, takes the help of a handsome stranger Yuvaraj aka Rajendar (Rajendra Kumar). Pretence turns into reality. They fall in love, he is mistaken for a prince, and things go wrong. Kidnapping, robbery, impersonation and what not follow. Seema is staying in a working Girls Hostel-she is very conservatively brought up by her father, who manufactures dolls, which Seema sells in the market. She never goes out in the evening, either for dinner or dance like other girls because she has no boy friend. Girls make jokes about her and Seemas frend Shobha is very about the whole affair. . One day shobhapersuades Seema to inform other girls that she is going for dinner with ther fincee, at Astoria Hotel and she tells them that her fiancee is a Colonel in the army. Girls are surprised and shocked and they decide to go to Atsoria Hotel and see the Colonel. . Seema is forced to go to Astoria Hotel. She had no boy friend, no fiancee. However, she spots a young handsome military man. She appro- aches him, tells her story and requests him, tells her story and requests him act as her fiancee for the time being. . This starts a romance between the two, though seema wanted to end it there and then. The Colonel, whose name is Rajinder, says "I am here for three days only and please continue to see and dine with me and that will also convince your girl friends." . They fall in love with each other. One night, a photographer takes their picuture together and next morning it is published in papers with a caption "Prince and his Bride-to-be". Girl show the picure to Seema. She quarrels with the Prince and bangs the phone. Same picure is seen by the king and queen, father and mother of the Prince who is gone for shikar, in the camp. Princes A.D.C. shows the photo picure to the real prince. He is surprised. He sees the similarity of faces and rushes to Delhi to find out who is the man - rather the IMPOSTER. . Girls show the picture to Seemas father, who has come to visit her. Seema is forced to admit that she is engaged to Prince, who intends to marry her. . Meanwhile, the two crooks, who had installed Rajinder as the Prince, come to the hotel and threaten him to cooperate in getting delivery of the necklace from the Jeweller, otherwise his mother, who was kidnapped by them, will be killed. Check out this page for more updates on Akeli Mat Jaiyo. Rafi Lata - Yeh To Kaho Kaun Ho Tum - Akeli Mat Jaiyo  Yes My Darling! This page provides latest and updated information about Akeli Mat Jaiyo (1963) movie which released on 1963. Akeli Mat Jaiyo (1963) is directed by , produced by , starring .We have also provided 1 trailers and videos, 2 photos, 9 user reviews, and 0 critic reviews.Akeli Mat Jaiyo (1963) has received 2.5 rating from user reviews.The overall rating of Akeli Mat Jaiyo (1963) is 50 and movie is 2.5.You can review, like, dislike this movie and also can add to favorites. You can also find information on showtimes, CDs, DVDs, online rental, online free watching.